At last I have links to my favourite blogs on my blog page. I am terribly html illiterate and could not have done it without help from the two Knitterati Amanda and Dawn. Over the weekend I hope to add more links and some buttons. 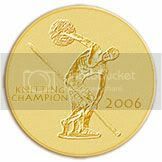 At last I can add the Knitting Olympics button from the event that started this blog in the first place. With any luck I may even be able to link to the Pomotamus KAL site. Knowledge is power, but a little knowledge is dangerous. I could be in for some trouble. posted by Scheherazaad @ 9/01/2006 10:43:00 a.m.
honey, itz gonna B good trouble.